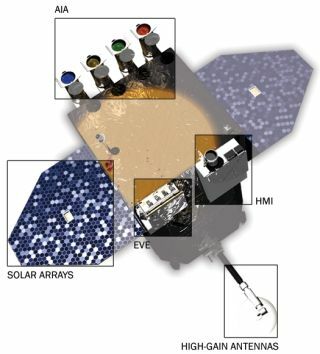 The Solar Dynamics Observatory has a Helioseismic and Magnetic Imager (HMI), an Atmospheric Imaging Assembly (AIA), an Extreme Ultraviolet Variability Experiment (EVE), as well as solar arrays and high-gain antennas. The Solar Dynamics Observatory is a NASA spacecraft launched in 2010, in time to catch sunspot and solar activity at its peak in 2013 as a part of the sun's 11-year cycle. The satellite continuously records high-definition views of the sun's atmosphere in detail never seen previously. In addition to simply observing the sun, NASA is using this observatory to get better at predicting solar activity. SDO aims to provide insights on the structure of the sun's magnetic field, as well as how energy is transferred from the sun into space. SDO is the first of NASA's Living With a Star program probes. The sun is an invaluable source of energy and warmth for the planet; however, its variability can at time cause problems. A large solar storm has the capability to knock out power lines or communications satellites, for example. The program's major goal, therefore, is to understand why the sun's energy varies and how it can affect Earth. One instrument on board is the Atmospheric Imaging Assembly, which can record pictures of the sun in IMAX resolution. With high-definition images available in most of the 10 available wavelengths every 10 seconds, it allows scientists to watch over the corona and see any changes — no matter what temperature. The continual observations were expected to yield more information on the causes of solar flares and coronal eruptions. The other instruments are the Helioseismic and Magnetic Imager, which can track electric currents and magnetic activity in the corona, and the Extreme Ultraviolet Variability Experiment, which monitors ultraviolet solar emissions. The spacecraft originally had a five-year life span, but has lasted beyond an 11-year solar cycle, and was still performing well as of mid-2018. SDO cost $850 million to construct and launch. The satellite was lofted into space Feb. 11, 2010, aboard an Atlas V rocket from Cape Canaveral Air Force Station in Florida. From there, the satellite was placed in an inclined geosynchronous orbit that traces a figure-eight path every day above the Earth as it watches the sun. "SDO's inclined geosynchronous orbit was chosen to allow continuous observations of the sun and enable its exceptionally high data rate through the use of a single dedicated ground station," according to the Solar Dynamics Observatory website. Controllers were astounded at what SDO produced in its first year of observations, particularly its views of the sun's corona. Normally that portion of the sun is best visible during eclipses, but with SDO, scientists were able to watch what the corona was doing from its tip to the sun's surface. "The science is really ramping up and it's very exciting to find out all the capabilities of the instruments," Phil Chamberlin, SDO deputy project scientist at Goddard Space Flight Center in Greenbelt, Md., told Space.com in 2011. The mission has definitely exceeded my expectations so far — and my expectations were high to begin with." As the sun moved toward solar maximum (when solar activity is highest) in 2013, SDO's capabilities really began to shine for astronomers. A May solar flare was captured in high resolution, with pictures in multiple wavelengths showing the extent of the prominence eruption. The flare, though, was considered medium-sized, meaning that more spectacular eruptions could come before the cameras. With SDO's eye on the sun, anything that passes in front of it could also be captured by camera. A notable example was Venus, which transited across the sun (from Earth's perspective) June 5-6, 2012. The event is predictable but extremely rare; the last transit before was in 2004, but the next one won't occur until 2117. In 2016, SDO also captured Mercury going across the face of the sun. The next transit will occur on Nov. 11, 2019. In 2016, SDO captured a solar "tornado" that was five times wider than Earth, moving across the sun's surface — in both images and video. At the time, NASA said this was likely the first time a video had been caught of the activity. The solar tornado was shaped by the sun's magnetic field; tornadoes on Earth, by contrast, occur due to wind activity. It also moved a lot faster; scientists estimated the sun's tornado whirled at up to 186,000 mph (300,000 km/h), while an Earth storm typically goes no faster than about 300 mph (483 km/h). More of these plasma tornadoes have been captured by SDO, such as one that occurred in late 2015. Observing events such as this gives scientists more insight into the underlying mechanisms of the sun's plasma production. SDO's long-term observations of the sun also show scientists when something different is happening. For example, in June 2011 there was a coronal mass ejection that ejected an immense amount of plasma, or superheated gas. Scientists in 2014 published results saying they observed the plasma splitting into "fingers" of matter in a similar way that has been observed in the Crab Nebula, a supernova remnant. This was an unusual opportunity to study what is known as the Rayleigh-Taylor phenomenon on a large scale. Also in 2014, scientists observed magnetic field lines looping and causing an eruption in the sun's atmosphere. The high-resolution footage captured by SDO confirmed a theory that had been held for years. These sorts of observations will make it easier to predict where large flares happen, which could better protect infrastructure on Earth, scientists said at the time. In 2017, NASA released a video showing seven years of sunspot observations by SDO. That same year, SDO participated in observations of the total solar eclipse that swept across the United States in August. SDO regularly takes pictures of all solar eclipses it sees, including a partial one in October 2017 and a total eclipse on its launch birthday on Feb. 11, 2018. On Sept. 6, 2017, the sun showed that it could still send out huge solar flares even when it's not at peak activity. It belched out an X9.3 flare, the strongest one since 2006. That November, SDO also saw a circular filament — a cloud of charged particles that usually appears as an elongated strand. NASA said the find was not scientifically noteworthy, but still interesting as it is a rare view. SDO had a popular chicken mascot called Camilla Corona SDO, who regularly attended NASA Social events and even once took a balloon ride to the edge of space. The mascot was reassigned to more general public relations work in 2013.